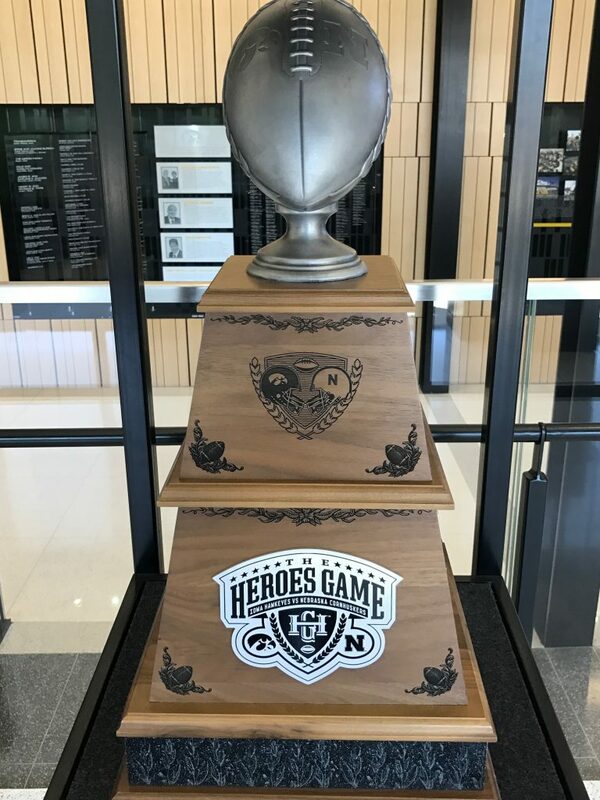 The Iowa Hawkeyes travel to Lincoln to face the Nebraska Cornhuskers in the annual battle for the Heroes Trophy, which is currently held by the Hawkeyes. This is the final game of the regular season for both teams and will be played at Memorial Stadium. Both teams have struggled this season: Iowa on Offense and Nebraska on Defense – so this game will likely be decided by which one of those two units plays better on Black Friday. The Hawkeyes have seen their bowl options diminish after losing their last two games at Wisconsin and vs. Purdue. The Cornhuskers cannot become bowl-eligible even if they defeat Iowa (under the normal bowl selection rules). This is the seventh consecutive season that these two teams will meet on Black Friday. Each team has won three of the last six games. This tradition will continue in 2018 and 2019 but in 2020 and 2021 Iowa finishes the regular season playing the Wisconsin Badgers on dates to be determined. Nebraska will face off against B1G West rival Minnesota those two years. The Hawkeyes have won three of the last four games, including two straight in Lincoln and last year’s contest 40-10 at Kinnick Stadium. FSI will televise the game with announcers Mark Followill and Danny Kannell. As usual, it will be broadcast on the Hawkeye Radio Network with Gary Dolphin, Ed Podolak, and Rob Brooks – and will also be available on XM Channel 84 and Sirius Channel 84. Kickoff is scheduled for 3:05 PM at Memorial Stadium. Because of the short week and Thanksgiving Holiday the regular Look Ahead is replaced this week by 1st and 10 from Iowa Athletic Communications. 1: Iowa has won the Heroes Trophy the last two seasons, and has won two straight games played in Lincoln. Iowa is 2-1 in trophy games this season, and 9-2 in trophy games since the start of the 2015 season. 2: DB Josh Jackson leads the country in interceptions (7) and passes defended (24), and ranks third in passes broken up (17) and interception return yards (163). His seven interceptions tie for fourth among Iowa’s single-season leaders. Desmond King (2015), Lou King (1981), and Nile Kinnick (1939) share the single-season Iowa record with eight. 3: QB Nate Stanley needs four touchdown passes to tie Chuck Long for Iowa’s single-season record. Long threw 27 touchdowns in 1985. Stanley has 23 touchdown passes, third in the Big Ten and tied for 19th in the nation. He is the first Hawkeye to throw 20-plus touchdowns in a season since James Vandenberg threw 25 touchdowns in 2001. 4: LB Josey Jewell, one of five finalists for the Bronko Nagurski Trophy, leads the Big Ten and ranks third in the nation with 11.7 tackles per game. He has 117 tackles this season, tops in the Big Ten, fourth nationally, and nine shy of matching his single-season career high. He is a finalist for the NCAA Senior CLASS Award, and a semifinalist for the Lott IMPACT Trophy, Bednarik Award, and Butkus Award. 5: RB Akrum Wadley needs 138 rushing yards to reach 1,000 yards this season. He rushed for 1,081 yards in 2016, and with another 1,000-yard campaign could become the fourth Hawkeye in program history to produce back-to-back 1,000-yard rushing seasons, and the first since Fred Russell went back-to-back in 2002 (1,355) and 2003 (1,264). 6: TE Noah Fant has 25 receptions, including a team-high eight touchdowns. The eight touchdowns are a single-season record for an Iowa tight end. He has 14 catches that resulted in a first down. Fant’s eight touchdowns are the most by a Hawkeye since Marvin McNutt caught 12 touchdown passes in 2012. 7: The Hawkeyes have three players that rank in the top 20 in the Big Ten in sacks. DE Anthony Nelson is tied for seventh with six sacks (27 yards). LB Josey Jewell and true freshman DE A.J. Epenesa are tied for 18th in the Big Ten with 4.5 sacks. Among league freshmen, only Northwestern’s Samdup Miller (5.0) has more sacks than Epenesa, who leads Iowa with eight quarterback hurries. Jewell’s 4.5 sacks are a single-season career high. 8: Season-ending injuries to senior tackles Ike Boettger and Boone Myers have cleared the depth chart for redshirt freshman LT Alaric Jackson and freshman RT Tristan Wirfs. Jackson has started every game this season at left tackle. Wirfs has started the last six games at right tackle. He is the first true freshman in Ferentz’s 19 seasons to start at offensive tackle. 9: Iowa’s first 11 opponents in 2017 have a combined record of 79-42 (.653). Iowa’s three nonconference opponents (Wyoming, Iowa State, North Texas) are a combined 22-11. TeamRankings.com lists the Hawkeyes at No. 8 in strength of schedule in the country, third among Big Ten teams (No. 3 Penn State, No. 7 Ohio State). 10: Kirk Ferentz has 141 overall wins and 85 Big Ten wins as Iowa’s head coach. The 85 conference wins rank sixth among the conference’s all-time winningest coaches in Big Ten games. Ferentz is two wins from tying Hayden Fry as the Hawkeyes’ all-time winningest football coach. 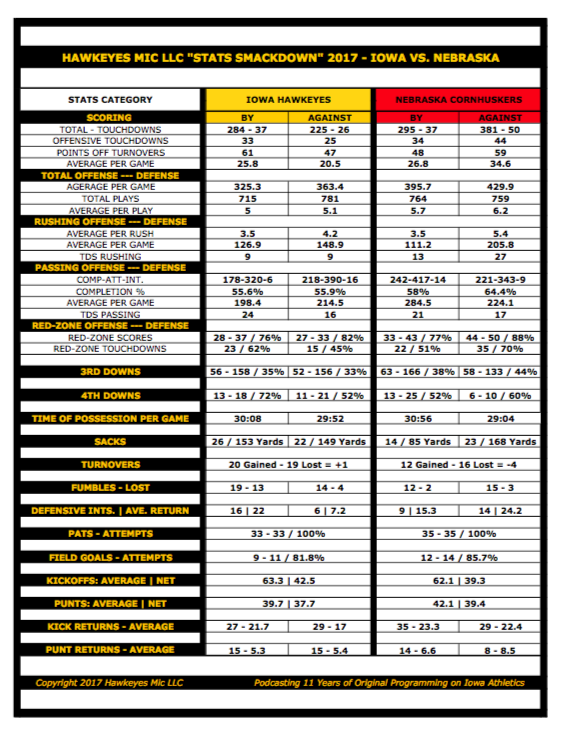 Iowa – Nebraska Game Week Content is here. Stats Smackdown: Iowa – Nebraska is below.